In the collection at the Victoria and Albert Museum, London, is a rare example of a late seventeenth century silk satin boned bodice decorated with parchment lace. The bodice is typical of the 1660s with a long waist, shortened cartridge pleat sleeves and an off-the-shoulder neckline, and would have formed the upper part of a court gown. The bodice is has eyelet holes worked down the centre back and would have been straight laced. The stain outer layer is a cream satin, and the bodice is highly decorated with silk parchment lace, silk wrapped wire motifs and two-coloured silk cord. The first task was to scale up the pattern from the original 1:4 pattern onto some spare linen fabric and pin it together for fitting. I only needed to make slight adjustments of one inch to the width to the original pattern in order to get a good fit. This extra inch was spread across the back and side panels with a quarter inch added to both the side and side back pieces, and half an inch to the centre back on both the left and right sides. The wax acts like a starch on the fabric making it easier to keep the pieces exactly aligned while sewing, and this garment requires a lot of stitching! The wax assists in prolonging the wear of the finished garment against any friction with the boning. When placing the pattern on the linen, I ensured the pieces lined up with the grain of the fabric. 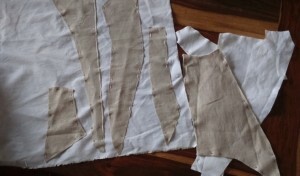 One wants to avoid cutting the pattern on any bias as this provides stretch to a garment.....and so after cutting 38 pieces of linen, 4 pieces of buckram and 2 pieces of wool, we have all the pieces to complete the construction of the base layer. Next was sewing together the front and back pieces of each section and stitching the boning channels. The centre front, front side, side back, centre back and shoulder panels on each side all have 5mm boning channels sewn in running stitches approx. one eighth an inch long. The stitch length seems quite long, but the purpose is more to guide the boning rather than hold it in place (in the original each baleen strip is stab stitched in place at both top and bottom to hold it in place). After completing the boning channels, a running stitch hem was added around all sides except the top of the centre front and front side panels. 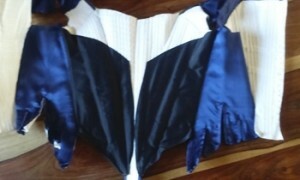 The panels were then whip stitched together to create the front of the bodice. The construction of the two centre side panels differ from the panels as they consist of a double linen layer, followed by a double buckram layer, and then a single wool layer which are whip stitched in the centre of the panel and quilt stitched across the whole of the rest of the panel. As whalebone is out of the question, I chose to use museum quality synthetic whalebone. Reeds or bents would also be a suitable alternative, although these are not as durable as the synthetic whalebone, and so would need to be replaced from time to time (*note: if you choose to use reeds, then it is advisable to wax the reeds rather than the linen before insertion). 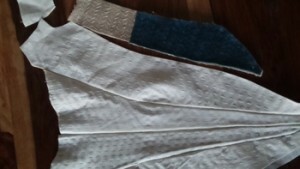 An additional layer of linen was added to the inside of each side front panel, two reinforcement strips across the bottom of the two centre front panels, and a linen channel up the centre front (over the whip-stitched seam) to hold the removable busk. 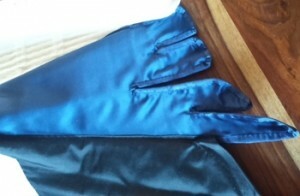 I have chosen to use a darker colour scheme of dark blue silk satin and black silk taffeta for my bodice. Each top layer panel was cut out of silk and individually attached to the boned base layer using prick stitching. In order to get the silk panels to lie smooth over the bodice when worn, the panels were pinned and stitched to the base layer while the base layer was made convex. The side panels are the first to be attached, followed by the side front, shoulder, then centre front panels. The back panels were attached last. Before attaching the shoulder and back panels, a strip of silk grosgrain ribbon was attached to the top edge of the back and shoulder panels, stopping at the edge of the straight front neckline. The lengths of grosgrain ribbon edging the tabs were added after the silk top layer was attached. Once the silk layer was attached, 19 lacing holes were punched through each of the back panels with an awl and each hole edged with whip stitching. Each sleeve is made in three parts; a topsleeve, an undersleeve and a wing. The top and undersleeves consist of a satin layer interlined with fustian, with an extra layer of linen added to the upper part of the topsleeve. The wings consist of a satin layer and a double layer of linen with a single boned channel. 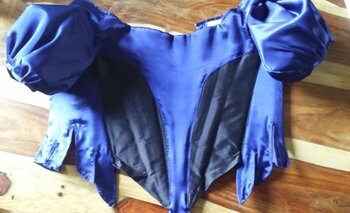 The topsleeve and undersleeve were sewn together to form the actual sleeves, while the wings were sewn over the shoulder of the bodice right side to right side. The bottom edges of the sleeves were flat pleated most of the way round, and then edged with grosgrain ribbon. 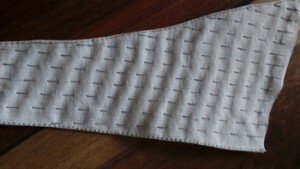 The top edges were cartridge pleated using a triple row of stitching. The undersleeve section of the sleeve was basted to the bodice while the cartridge pleats of the topsleeve were then whipped into place around the shoulder. 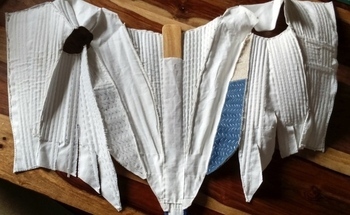 The wing was then folded over the seam and attached to the sleeve head with prick stitches. Posted in 17th Century Clothing, English Civil War, Stays & Corsetry.